The Dark Ranger: They Are Finn-ished! June 12, 2007 -- They have gone from prospects to suspects and now it appears as if both Jarkko Immonen and Bryce Lampman will be leaving the Rangers organization to play next season in Finland. The Dark Ranger has learned that Immonen, the 25-year-old restricted free agent who failed to grab the Blueshirts' second center-spot when presented with the opportunity last winter, is on the verge of returning to his native country for a guaranteed contract far more lucrative than the two-way qualifier he'll be presented by the Rangers. At the same time, Lampman, the 24-year-old defenseman who has played only 10 games with the Rangers - one last season - since his fourth-round selection in the 2001 Entry Draft, has signed a contract with TPS of Finnish Elite that contains an out clause should he sign an NHL contract by July 10. The Blueshirts are not expected to extend a qualifying offer to Lampman, also a Group II free agent. 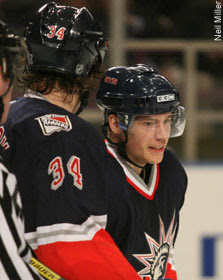 Immonen, who came to the Rangers on Mar. 3, 2004 from the Toronto organization as part of the Brian Leetch deal, played 14 games last season for the Blueshirts in which he recorded one goal and five assists. Though he spent most of the year with the Wolf Pack of the AHL, he did have a run of 11 straight games with the Rangers from Dec. 7-26, the first seven of which he skated between Brendan Shanahan and Matt Cullen (or, for one game, Martin Straka rather than Cullen). Immonen appeared intimidated playing with Shanahan. The line never clicked. With coach Tom Renney regularly referring to doubts about Immonen's skating and his ability to prosper in an accelerated NHL pace, there is little chance he'd be able to earn a spot on next year's club, even with Michael Nylander's status in limbo. Immonen's ship has sailed. Should a worst-case scenario develop prior to July 1 with Nylander (who has yet to hire an agent) choosing to go on the open market rather than re-signing with them, the Rangers would aggressively pursue both Scott Gomez and Chris Drury rather than choosing between the impending free agents.